Fall Projects & Blog Hop! I am SO excited to be one of the NEW Design Team Members at The Original Scrapbook USA Expo. And, I’ve been able to look at their blogs and there is talent galore! The best way for you to get to know these talented ladies is to hop on over to each of their blog’s and check out their fall crafting too after you take a peak at mine! And, between now and Wednesday November 7th at midnight, visit each of our blogs. While on our stomping ground, leave a comment. Each time you comment on one of their blogs, as well as mine, you will be entered to win 2 of DCWV’s brand spankin’ new Christmas 4X5 pads!! Great news is that if you comment on each of our blogs (as well as the Scrapbook USA Blog) you will be entered 8 times!! Wahoo! So, start “hoppin” and thanks SO much for stopping by! Here’s a list of the other blogs for you to check out! And now, without further ado, here is one of my fall crafts that has only been a year in the making. Yep, an entire year! Ouch. I’ve had this long wooden dowel that I’ve wanted to do something with and these cute little chipboard banner shapes. They’re little guys and were too cute to pass up. 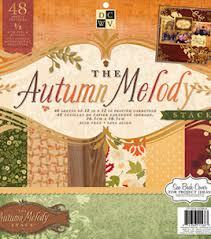 The “Autumn Melody” paper stack and embellishments were perfect for making a cute little fall banner with my dowel. I simply traced the shapes on my paper, inked the edges, used wood glue to adhere them, and strung them up with some brown ribbon. Then, I added a few embellishments. Finally, I tied various colors of ribbon to the dowel and one on the top so I could hang it up. Ta-da! A fun little banner for our living room. We don’t have many places to string up bigger banners but I love them too much and had to find a way to incorporate them anyway. I did consider putting some letters on the banners, but decided I wanted the pretty papers and embellishments to speak for themselves. These papers are so beautiful-they really do speak for themselves! Be sure to stop by the other blogs on our fun hop, including the Scrapbook USA blog, so you can enter to win!! !